Louisiana Half-Face was published in the first half of 2010. It continues a projected literary cycle which began with The Fanatical Pursuit of Purity—at least thematically. This novel fits into the horror genre most explicitly and draws on various icons from this set. These include Mummies, Skeleton-Men (the figure of Dramabu in Haitian Voodoo), a da[e]mon called Cranium Biter Dye, and a split-face or schizoid character which gives the book its title. But this has less to do with a Right-wing version of Burroughs than one might suspect. My estimation is that Bowden configures contemporary horror writing to be de-intellectualized tragedy. If, for example, Stephen King, Anne Rice, or Graham Masterton began to philosophize about motivation then they would lose about 80% of their audience without comment. Indeed, as a literary sideline, the crudity of current Gothic prose signals its “proletarianization”—to use an image from the conservative essayist Professor Duncan Williams in Trousered Apes. Just on a literary level: there is little comparison between Algernon Blackwood, Arthur Machen, Walter de la Mare, and contemporary purveyors of “slasher” items or gore. Yet this remains a sideline to the author’s main concerns. Much of contemporary artistic life (although very interesting) is without any reliable meaning. A genuine semi-nihilism—of a Bret Easton Ellis type—hangs over Western culture like a pall. How did the Ancients and the restorationists of early Modernity, the Renaissance, impute an engagement with life . . . with Heidegger’s Being? Well, it was primarily through a tragic or ennobling sense of life. If one computes tragedy as literary horror, underpinned by philosophical acuity, then you begin to realize that this author believes in reintegration. One of the reasons he concentrates on slightly cruder or “lower” forms, like horror, is their presence beneath the literary radar. No ideas or concepts of culture are ever destroyed—they are merely displaced. Where did the belletrism of identity and the heroic—even a threnody of the cruel or violent—really go? The answer is that it went down into mass culture—essentially despised by the New Criticism (F. R. Leavis and I. A. Richards) of the mid-20th century. Even more acutely: where did fascistic literature of an ultra-masculine cast go? Why, at the level of Wyndham Lewis’ The Apes of God, Henry de Montherlant’s The Bachelors, and Yukio Mishima’s Sea of Fertility, did it disappear altogether? But many of these themes, stripped of poetry and intellect, re-emerge as actions in mass culture. The extreme Left, as exemplified by the post-structuralist school, is deeply aware of this conundrum as well as the dangerous “essentialisms” lurking down there in the depths. I leave it to your imagination what tendency of opinion these wolves represent. Yet, suffice it to say, that in the cast list of James Herbert’s The Spear (based on Trevor Ravenscroft’s The Spear of Destiny) the extreme Right is the villain. One could argue—from this perspective—that this trail is exemplified perfectly by Ira Levin’s The Boys from Brazil (for example). Yet if radical elitism, in its customary guise, is always the enemy . . . then what about an example of horror fiction which also contains a strong dose of European cultural fundamentalism? Surely that would be the worst thing in the world—in a doubled up or Inglourious Basterds sort of way. What could be more “Situationist,” more transgressive, than “Right wing” horror . . . at least on another level of reality? On a rival plane altogether, the New Left Marxist Theodor Adorno, in a text called Minima Moralia, said that all poetry was redundant after Auschwitz-Birkenau. Everything! Well, imagine if even that implacable and postmodern logic was contradicted by the tragic idolatry of a form which worships a Nature that is neither good nor bad. What begins with the sinister Baroque of H. P. Lovecraft can become over time the attitudinizing of Savitri Devi—albeit filtered through multiple levels of estrangement, denial, advance, and projected awe. Interestingly, this volume is dedicated to Savitri Devi with a brief poem on the copyright recto—a page in most books which is customarily ignored by readers. It befits a daughter of the black sun, as its anonymous bard describes it. 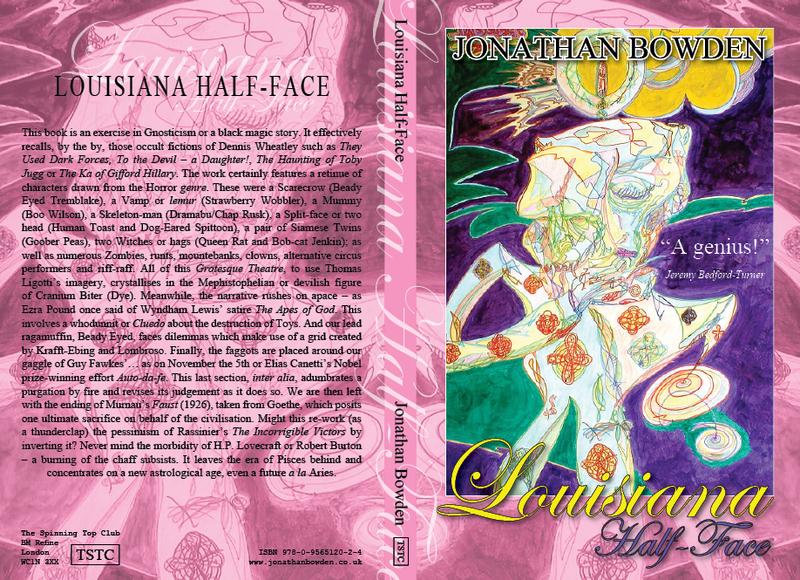 You can buy or read Louisiana Half-Face here .